Prickly and Bitter: Swim little fishies! This is one of the few tropical species of plants that grow well indoors that I'm disappointed no one has told me about before a couple of weeks ago. To me, these flowers are just plain awesome. Not just awesome for the fact that they literally look like goldfish (unlike other plants named after animals like the Shrimp Plant; sorry shrimp plant! ), but because of their unique adaptations to target their preferred pollinators. 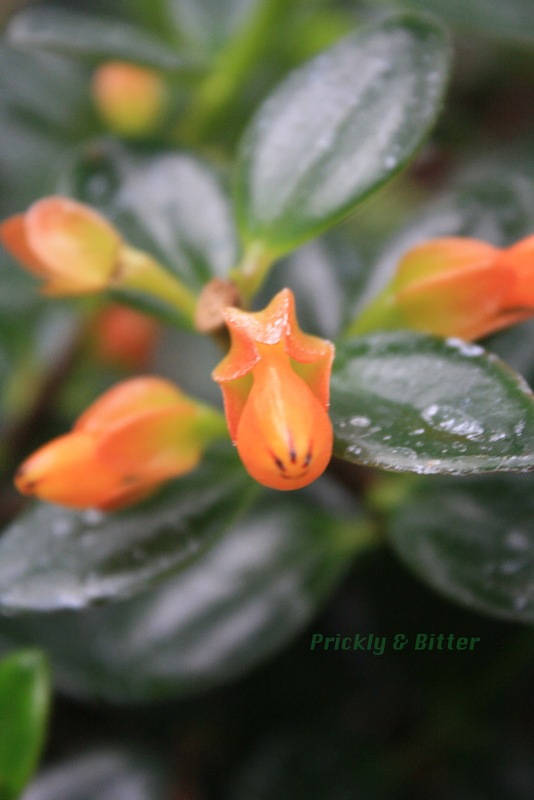 The goldfish plant is native to the Amazon and surrounding areas, with the native range stretching from Brazil up to Mexico. This plant, while a very popular indoor plant in the southern United States, is still very common in the wild. It also grows incredibly easily indoors, so the need to return to the wild to collect more plants is rare. The reproduction of this plant is fascinating. In fact, it hardly ever happens, and never happens sexually in this species. Hard to believe? I agree! But the biology has been well documented, and so here's what happens. The flowers are just an offering to species that need nectar in the wild, which is practically unheard of in the wild. This species of Nemanthus is asexual, meaning the flowers are not produced for the purpose of reproduction. 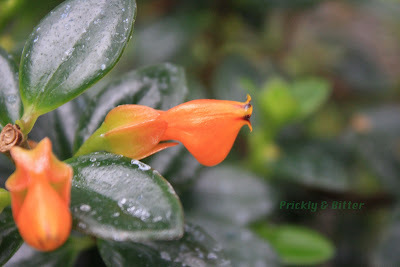 Close relatives of the goldfish plant, who have redder flowers that are less shaped like goldfish and more like tubes, do reproduce via seeds (which requires sexual reproduction) so it appears as if this plant has lost the ability somewhere down the line. Instead, it reproduces asexually by severing its young branches, having them fall off the plant, ideally roll down a hill and root in a new location. In the wild these plants are often epiphytes, meaning they'll grow on just about any surface that they can grab onto (and rarely obtain nutrients from this surface; they get those from the humid air). The goldfish are just swollen sacs of nectar available for any insect or bird to exploit at their will. Hummingbirds, despite the flowers of this species being orange and not red, are still attracted to the flowers and will use it as a preferred nectar source when the flowers are in full bloom. Some insects with biting mouthparts will chew tiny holes in the bottom of the goldfish stomach to allow the nectar to freely flow out of the flower, and drink all they can get before returning to their nest. Other birds will use this same strategy, poking holes in the flowers and drinking the nectar that flows out. Every so often the goldfish plant will make something that looks like seeds when the flowers are spent, but they are sterile and not worth collecting since they will not produce a new individual (bananas are like this also; we call this not being "true to seed"). 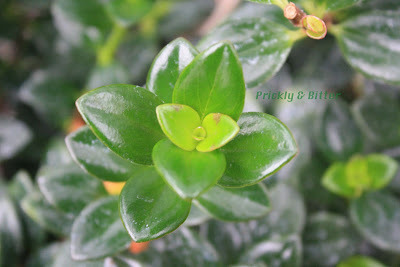 Like many succulent plants with fleshy leaves, the goldfish plant produces chemicals in the leaves that are mildly irritating to the skin. If you have sensitive skin and are planning on propagating this plant by snapping off leaves and putting them in water to root (it really is that easy to make a new plant! ), make sure you wear gloves and you'll be fine. Cats and dogs (and other indoor pets) usually stay away from this plant despite having flowers that look like they would be fun to play with. There must be some kind of scent emitted from the leaves or flowers that lets them know it shouldn't be messed with. 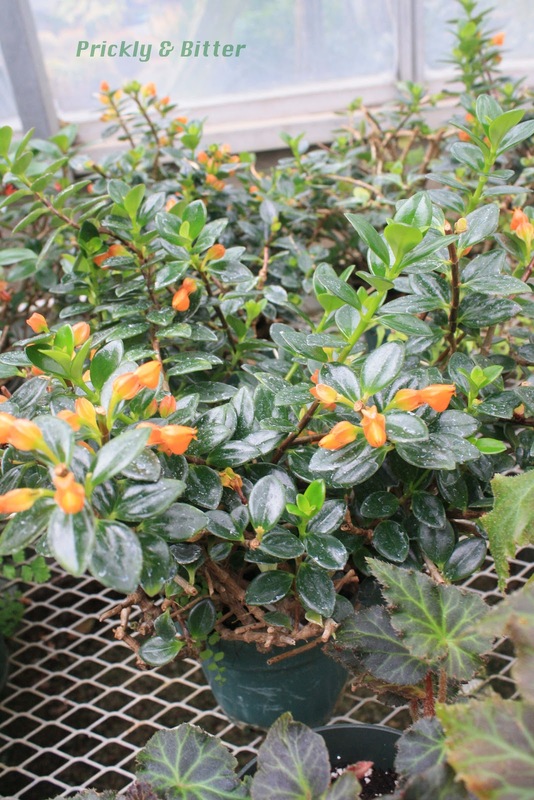 Goldfish plants are quite drought tolerant, so ignoring them won't bother them too much. They are also frost-tolerant (reportedly surviving brief exposures of -5 degrees Celsius or about 23-25 degrees Fahrenheit) so forgetting them outside on a cold night isn't a big deal. A word of warning, however, if you like using these plants as ornamental garden plants in baskets during the summer and have a backyard garden: they carry viroids. A viroid is like a virus, being able to be transmitted from plant to plant when they come in contact (or when the sap of one plant is on the leaf surface of another, where it can enter the leaf breathing pores or stomata). Viroids are present in many plants, and it is believed that some are just the result of a virus that had infected the plant but had mutated to no longer be able to reproduce so gets stuck in the plant as a sort of virus fossil or relic. Some viroids, however, are still able to cause disease in plants, especially crop species. The viroid that the goldfish plant carries causes no symptoms in the plant so you would never even know it had it...until it comes in contact with either potatoes or tomatoes. Then it wreaks havoc. The symptoms in potatoes and tomatoes are quite severe, reducing the yield of crops of these two plants quite drastically. Best to keep these plants away from each other! Viroids cannot be spread through the air, and this particular viroid doesn't last very long outside of the plant, so having them in the same garden is no problem as long as there's a distance between them.